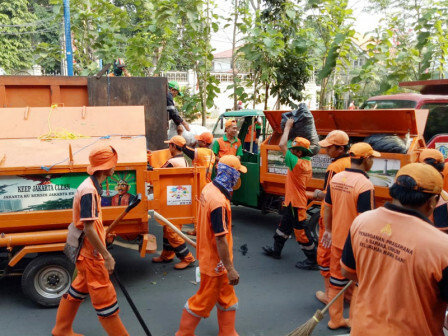 Central Jakarta Mayor's Plh, Premi Lasari wants information about garbage disposal hours could be socialized continuously to residents.
" We need to prevent transporting waste in rush hours"
"Monitoring and education should be done more intensively. Residents also needs to follow garbage disposal rules," she stated, Tuesday (8/28). According to her, waste which is transported above 6 AM will trigger traffic jam on the road near temporary waste disposal site. "We need to prevent transporting waste in rush hours or in conjunction with before and after office hours because it must disrupt the traffic," she explained. Related to this problem, Central Jakarta LH Sub-dept. 's Waste Management Section head, Risart Seristian ensured to socialize residents continuously.